Will the Dutch soon be moving en masse to the higher grounds of the Veluwe and holidaying in the Wadden Sea in Drenthe? On February 9, Vrij Nederland magazine published a great longread (now available in English) on dealing with rising sea levels. Many experts from Utrecht University had their say, including Maarten Kleinhans, Michiel van den Broeke, Roderik van de Wal, Marjolijn Haasnoot and Kim Cohen. 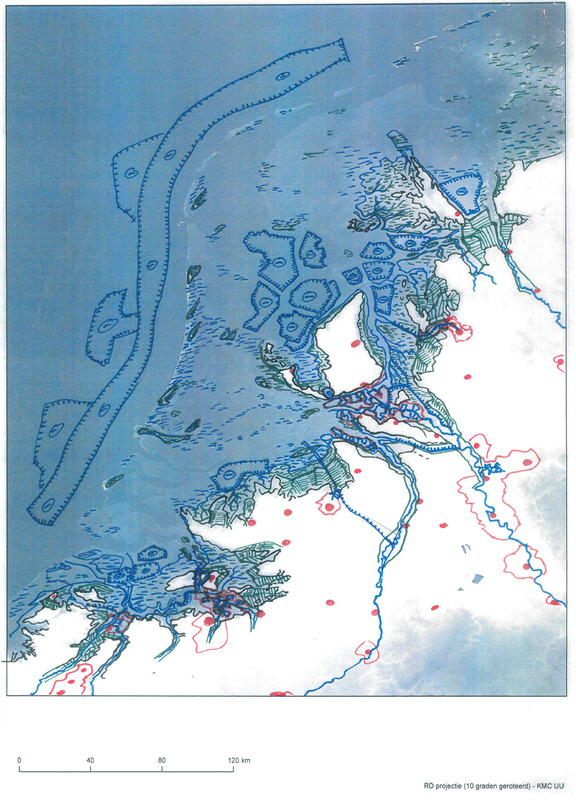 The magazine asked the latter to draw a map of the Netherlands as it may appear in the year 2300 in an extreme scenario. Dr Kim Cohen from Utrecht University sketches how things could end up. It’s not a map of ‘fighting back from an unforeseen catastrophe’ but instead it shows a possible outcome of just gradual developments triggered by retreat decisions. Cohen worked from the assumption that strategies as in the current Delta Programme will be maintained until half way the 22nd century. 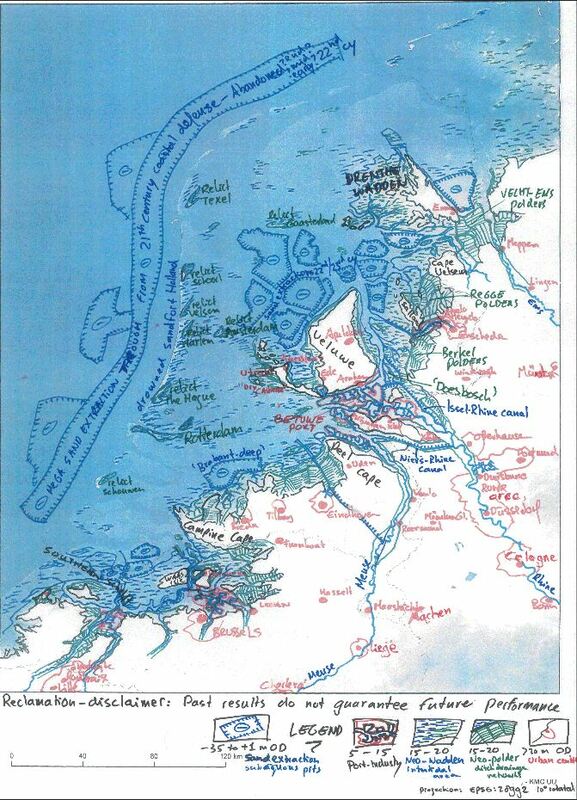 The coming century involves large-scale extraction of sand offshore to raise and replenish beaches protecting the major delta cities: ‘sand fortress’ Holland. Thereafter, the accelerating sea level rise will reach an extreme level of 18 metres above present in 2300, forcing the population to withdraw inland. On the left side: sketch map with labels. In the middle and on the right side: blind map without labels, and starting-point relief map (allowing for making such a sketch yourself). Click for larger images. The western Netherlands is submerged, leaving an area of shallows, and the Amsterdam canals are a divers’ paradise. 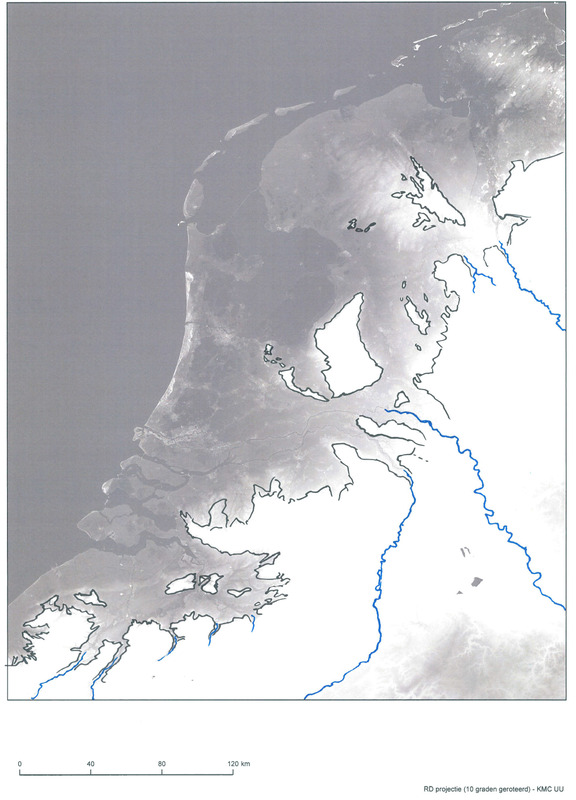 The shallow waters break up the waves, so that the high-rise clusters of cities such as Amsterdam and Rotterdam and the largest beach dune areas of Schouwen, Schoorl and Texel have become islands. In Utrecht, the 20th-century high-rise development Hoog Catharijne turns out to be a blessing in disguise: it acts as a breakwater so that the Dom tower is spared for the time being. Rotterdam Europort has moved inland to become the Betuwepoort, a reclaimed area built from recycled materials taken from the no-longer-populated areas, which is cheaper than sand extraction. Along the new coast line in the south and east ‘neo-polders’ have been created, just as in adjacent Belgium and Germany. The Wadden Sea has moved inland too.